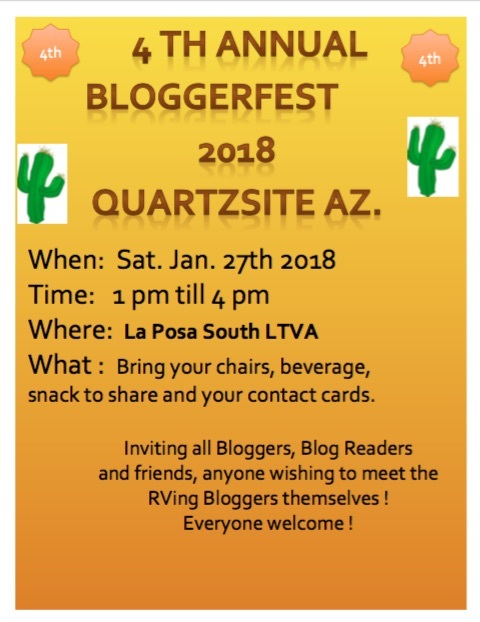 I was reminded this morning about Bloggerfest coming up Jan 27th in Quartzsite's LTVA South, while I have been aware of it and had full expectations of attending, given our change of life plans I checked this morning to see how long the drive is to Quartzsite. 3 hours. I really want to attend and so will be giving this a lot of consideration. Brad went to town yesterday to take care of some business regarding the purchase of our new lot and while he was gone I got to work. With 1.5 inches of rain in the forecast I wanted to get some caulking on a spot I had noticed. The resort has a company that looks after gardening issues for owners and I spotted Glenda when I was puttering so asked her to pop over when she was finished what she was already into. Our new site has about 9 palm trees surrounding it and they need trimming - badly. 4 of those are bigger ones which are actually on the neighbours property, the problem is that these palm trees have been known to have ants in them and I do not want them getting on the top of our rig. I stopped over and introduced myself to Ken, our new neighbour and inquired about the trees. I was hoping to get permission to have them trimmed but as it turns out, he has already got someone coming on Monday. Perfect. I also went to the real estate office to have them ask the current owner of our lot for permission to cut the trees on our site, I want them trimmed 'before' we bring the rig over there. Permission was received. When Glenda returned with our quote, $100 for 5 trees, we accepted it. For now this works, in future I think we will be finding another alternative. Dave & Karen have suggested we go halves on a clipper gadget we can both use. Brad returned with groceries, including 3 steaks. We invited Karen over for a BBQ supper as Dave is away for a few days. We had a lovely supper of Steak, Greek Salad and Cole Slaw, then Brad went inside to watch the Canada vs Sweden hockey game (Canada won 3-1). Karen and I played Dice outside until well into the dark. Haven't met anyone else who plays Dice so it was a nice surprise when Karen asked if we knew it. We have plans tonight to play some Crib (I'll try to remember pictures), and one of these days we shall teach both Dave & Karen how to play Kaiser. Look forward to that as we haven't played Kaiser for years. Very few people know the game and no one ever cares enough to learn. Things are moving right along for you guys. 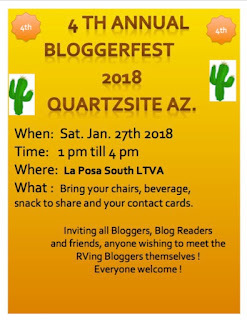 you could always drive you rig to Quartzsite for Bloggerfest and camp a few days in one of the many free areas if you like so it it is not a rush there and back in one day. Just never know who will show for this. last year about 35 people the year before 55. We know a lot of Vloggers who will be in the area also, so its a good chance to meet everyone... do not want to take the rig back to Q though, so will be driving in and back out. We should be receiving an Official Confirmation any day that the Ramada (Pavilion) is officially booked for Blogger-Fest on Saturday January 27, 2018 between 1-4 pm. Like George said bring the MH and stay at one of the free areas (Dome Rock Road or Plamosa Road to name a few.) Come the day before, leave the day after, even check out what is left of the Big Tent. Looking forward to seeing you there. Definitely want to go but don't want to move the rig, so its the car or nothing... aargh. So I'll get right to the point and change the subject. I think you mentioned that you were looking for a new/better motorhome for your new lot. Not sure what you mean by you can't buy in the US or we can't drive it the other 6 months in Canada. Bought two of my last 3 Motorhomes in the US. You import them through the RVIA process. Buy in one state take delivery in a bordering state so no sales tax. You pay the sales tax in Canada in the Provice you register it. You pay the GST at the border when importing. You can even sell your existing in the US. Forgot one important item. Do not trade your existing in. Do it as a separate transaction as the new one is GST taxed on its original sale price. Peter you are a wealth of information. We do need to do the RVIA for the Jeep anyway... but wouldn't we get a better price for our existing rig back home? Seems they are far more expensive in Canada. Yup...we bought our motorhome in US and imported to Canada. Just don't let em (RIVA) con you about the daytime driving lights rule. Its BS. If you mean US vehicles don't require daytime lights, I wasn't aware of that. Interesting. It sure was a great hockey game and I love dice! Sure hope we get to see you at Bloggerfest but that will make a long day for you. It would be a long day but we know so many people there... just have to get the gumption to do the drive. Most likely we will. Dawn, you are one of those people I really want to meet... I'll keep you posted. We probably will go it's just going to be a really really long day and I don't do those well.